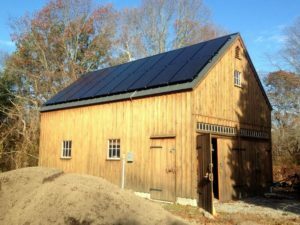 This system was installed on a standing seam metal roof of a barn style garage in Jamestown, RI. This section of the roof faces south-southwest. This 18 panel installation has been used as a hedge against increased electricity price for a portion of the customer’s electricity bill. This installation was completed on a very steep roof, with a slope of 45 degrees. In addition, the standing seam metal roof required a unique attachment system that pinches the standing seams rather than penetrating the roof into the rafters. The grant covered 25% of the installation cost. The owner of this system valued the financial return as well as the environmental benefits associated with solar installations.